FNP Ladeira Fonte das Pedras, s/nº, Nazaré. 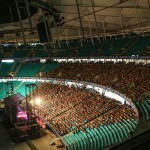 The ITAIPAVA ARENA FONTE NOVA is a great example for a multi-purpose stadium. 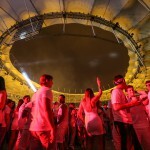 The stadium is not only an exceptional venue for football matches and the upcoming World Cup 2014, but also offers an amazing space in the southern opening for various events, such as concerts and parties. 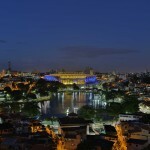 In 2008, the federal state of Bahia (Brazil) asked in an international design competition for proposals to reinvigorate the partially collapsed inner city stadium of Salvador da Bahia. The 1st prize in this competition was awarded to the architects SCHULITZ Architekten, located in Germany, in collaboration with TETRA Arquitetura from São Paulo / Brazil. 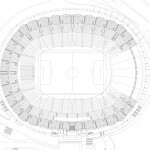 In keeping with the tradition of Brazilian stadiums, the footprint of ITAÍPAVA ARENA FONTE NOVA has the shape of a horseshoe with a large opening in the southern part of the stands. 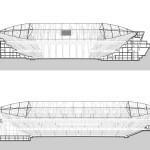 The traditional form in combination with modern stadium design aspects results in a sustainable building: The opening not only provides optimal air flow into the stadium bowl and simultaneously establishes a direct relation to the adjacent inner city lake, but also permits the use of the stadium for multi-functional activities: Concerts, theater presentations and various other events can take place in the covered space within the opening without conflicting with the pitch during the football season. A bridge-like restaurant floats above the opening giving visitors a unique experience with views over the pitch and the lake at the same time. 45 kg / m ², making it one of the world’s lightest stadium roofs ever. The roof structure’s optimised geometry is the key to fulfil the roof’s multiple functional requirements (sight lines, solar protection, drainage and wind loads). The façade was designed using horizontal shading elements with varying inclinations depending on the façade’s orientation provide sun protection whilst maximizing daylight use. 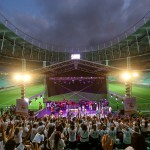 Furthermore, the use of rainwater reduces water consumption, the former stadium’s concrete was recycled and used as building material, the stadium’s energy consumption was minimized, the construction process was organized in a sustainable manner and the material’s primary energy consumption was considered in the design process. 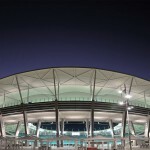 The architect’s sustainable design for the new stadium ITAÍPAVA ARENA FONTE NOVA in Salvador received the LEED Certification in Silver in February 2014. 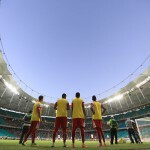 After 4 years of planning and construction the new ITAIPAVA ARENA FONTE NOVA was officially open on April 7th 2013 staging the football match between local rivals Bahia and Vitoria. 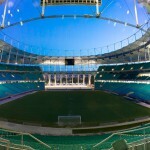 The new football stadium has a capacity of more than 50,000 seats. The arena staged six FIFA World Cup matches in 2014. 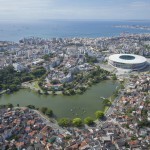 Also, the International Olympic Committee chose the ARENA FONTE NOVA to carry out the Olympic Football tournament in 2016. In 2015, the ITAIPAVA ARENA FONTE NOVA received the IOC/IAKS 2015 Silver Medal, the highest award in the category “Stadia”.